This morning RIM announced that pricing for the WiFi-only BlackBerry PlayBook tablet would start at $499 in the United States and Canada. Customers can begin placing pre-orders today through Best Buy today. AT&T, Cellular South, Cincinnati Bell, Office Depot, RadioShack, Staples, Sprint, Verizon and other retailers will also carry the tablet soon. According to this morning’s press release, the 16 GB model goes for just $499, 32 GB for $599, and 64 GB for $699. We first had a chance to try an early version of the tablet at CES 2011 this year. 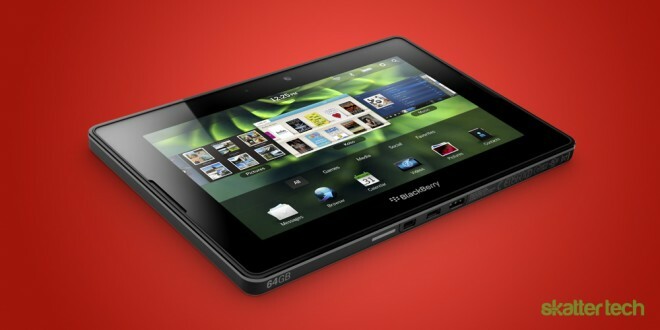 It is essentially a business-oriented tablet with multimedia capabilities, which RIM has generally struggled with. The HTML 5 browser supports Adobe Flash, the BlackBerry Tablet OS handles multitasking, the hardware can playback HD video, and much more. If you are looking for an in-depth comparison lineup along the latest generation of tablets, check out our infographic that throws the PlayBook into the ring with the Dell Streak 7 and Motorola Xoom. I am definitely looking forward to getting my hands on this device. At a price point that matches the brand new Apple iPad 2 on every capacity level, it will definitely drawn customers interest. Other tablets such as the Motorola Xoom start at a higher $599 price point for a 32 GB model with no affordable entry-level option. We will definitely be getting a review unit very soon, so stay tuned for a full in-depth review. To be the first to get updates, check out some subscription options here. Looks like you are confirming more features (Sensors: Accelerometer, Gyroscope, Compass & GPS) then what is listed on RIM site and on http://skattertech.com/2011/02/infographic-blackberry-playbook-vs-dell-streak-7-vs-apple-ipad-vs-motorola-xoom/ . Are these all confirmed? Yup, those details are straight from the official press release. Thanks for pointing that out, we will update the infographic as soon as we have a chance. That’s awesome. GPS, Orientation Sensor (Accelerometer), 6-Axis Motion Sensor (Gyroscope), Digital Compass (Magnetometer). Curious if this is a true un-assisted GPS? I means so you can used it like a Tom Tom without having to pay a monthly service like with A-GPS?? Also.. Looks like the only thing left “unknown” is the battery life.. I’ve only heard “as good or better” than iPad.. have you seen anything “official”? What’s your take on the Android “Player App”. You think it will prevent Android app developers from porting their apps to Playbook? or just give consumers that are on the fence about Playboook or an Andriod tablet the assurance that they can’t go wrong choosing Playbook?